It’s been a busy number of years for Tom Upton, and things are just on the verge of getting a whole lot busier. From playing at a 20,000 capacity festival to running by monthly nights at Pacha London and the Whitehouse, Tom hasn’t had a spare moment to stand still, alongside holding down 2 weekly residencies. These last 12 months has firmly established Tom Upton as an up and coming artist within the UK, and now currently focusing on additional international bookings. Holding down two weekly residencies at the Funky End in Aldershot, and the brand new night club in Fleet called MooMoo. Tom has spent the last 20 years putting together an impressive record collection and has been working the dance floors around the UK securing an Impressive bi-monthly residency at Pacha London and the White House London, additionally on top of that Aquarium in Shoreditch, and various other locations around the UK. Tom Upton started mixing with decks at an early age, in fact his love of music and mixing started in the summer of ‘96. Since then Tom has become a well-known dj across London and is now becoming recognised on a global basis and with an avid fan base of music fans waiting for his next podcast release. 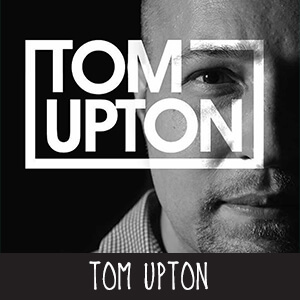 Tom Upton has also been involved with a number of festivals including GuilFest which he rocked a crowd of over 2500 clubbers. Tom Upton was asked back on consecutive years to close the festival specially requested by the festival owner himself. Tom has supported other global brands including Hed Kandi, Cream and BCM. Summer 2011 was a turning point for Tom Upton, working on his own music production; he is expected to take the music industry by storm with some of his up and coming releases.